Sr Dr Miriam Duggan (Kenya) and President Michael D Higgins. A new video interview with Irish missionary Sr Miriam Duggan, often referred to as ‘The Mother Teresa of Africa’, has just been launched in which she recalls her work as an obstetrician and in HIV/AIDS prevention and care. 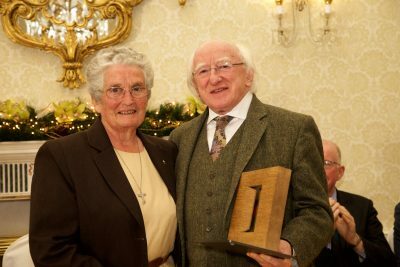 In 2015 Sr Miriam, a native of Limerick and a member of the Franciscan Missionary Sisters for Africa, received a Presidential Distinguished Service Award in recognition of her missionary work in Africa. Her work has also been recognised by the Parliament of Uganda and by her alma mater, University College Cork. Now aged 82, Sr Miriam graduated from UCC with a degree in medicine in 1964. She studied obstetrics in Birmingham, receiving her MRCOG in 1969 and FRCOG in 1982. She was one of the first qualified obstetricians in Uganda where she headed the maternity unit of Nsambia Hospital in Kampala for 30 years. She was also involved in the training of midwives and doctors. In response to the HIV/AIDS pandemic she helped establish clinics, as well as mobile-home-based care programmes for those ill with HIV/AIDS and the many orphans left behind. This prevention programme was very successful in Uganda in reducing the prevalence of HIV/AIDS. It was extended to 21 other African countries. The video ‘Sr Miriam Duggan: My Story’ is also being used to further the cause of Wicklow-born Mother Kevin, foundress of Sr Miriam’s congregation and the Little Sisters of St Francis in Africa. Mother Kevin was declared Servant of God by Pope Francis in 2016. In the 26-minute interview, Sr Miriam discusses her address to the Ugandan parliament on abortion; the abstinence programme she promotes, which has reduced the incidence of HIV from 25 per cent to 6 per cent; the role of Mother Kevin in the development of healthcare in Uganda; conscientious objection for pro-life medical students and healthcare personnel; and UK abortion experiences. Sr Miriam served as superior of her congregation for 12 years. During that time she was based in Dublin and was chairperson of the Irish Missionary Union when, with the government, Misean Cara was set up as a channel through which Irish missionary organisations could obtain funding from Irish Aid to support their development and humanitarian projects in the global south. Despite her age, she is currently working with out-of-school youth in Huruma in Nairobi delivering programmes on rehabilitation and character formation. She cannot register as a medical doctor due to her age. The interview with Sr Miriam can be seen here: https://youtu.be/15011lJzRoA.